The US dollar strengthened today after Federal Reserve Chair Janet Yellen revealed that interest rates will likely start to rise later in 2015. Yellen stressed that interest rates would likely start to rise even before inflation and wages have normalized. Yellen's comments from earlier today, which were seen as being moderately hawkish, resulted in the US dollar strengthening against a number of different currencies. 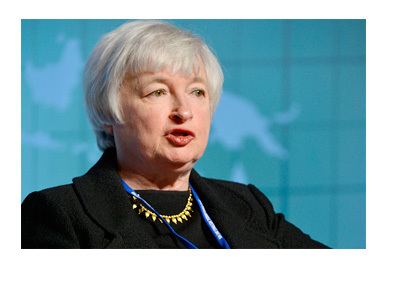 In her comments, Yellen stated that the exact timing of any Fed action would depend on "incoming economic data". The "actual path of policy", Yellen said, "will evolve as economic conditions evolve, and policy tightening could speed up, slow down, pause, or even reverse course depending on actual and expected developments in real activity and inflation." Once the Fed has initially increased interest rates, Yellen also said, further, gradual tightening in monetary policy will likely take place. The Federal Reserve has held short-term borrowing costs near 0% for 6 1/2 years and has been waiting for a sustained uptick in the economy to begin a tightening cycle. Earlier in the year, people had speculated that the Federal Reserve's first interest rate hike in the upcoming tightening cycle would occur in June. Now, however, the general consensus seems to be that interest rates will be going up in October, barring some sort of an unexpected decline in the US economy.